Description: The Bullet Stop has collaborated with Grouse Creek Academy to provide a 2 day shooting course focusing on improving your skills with both the carbine and handgun. You will learn to engage targets with a handgun out to 50 yards and beyond, transitioning from one firearm to another smoothly, acquiring and engaging multiple targets rapidly, engaging targets while moving, how to acquire and engage targets left, right, over and under obstacles. This class is designed to fit a wide variety of skill levels, from the novice to experienced shooter. At the end of this course , students will be able to handle both their handguns and carbines safely and proficiently and transition from one to the other with confidence. Must have your own firearms (carbine 223 or larger, handgun .380acp or larger). Must have a holster and sturdy belt for the handgun and a sling for the carbine. Must have a minimum of 3 magazines for each firearm and magazine carriers for all. Minimum of 500 rounds for both the carbine and handgun. Ammunition can be purchased from The Bullet Stop at a 15% discount until the day of class. Hearing protection (electronics preferred) and eye protection. Not a requirement, but knee pads are a recommendation. 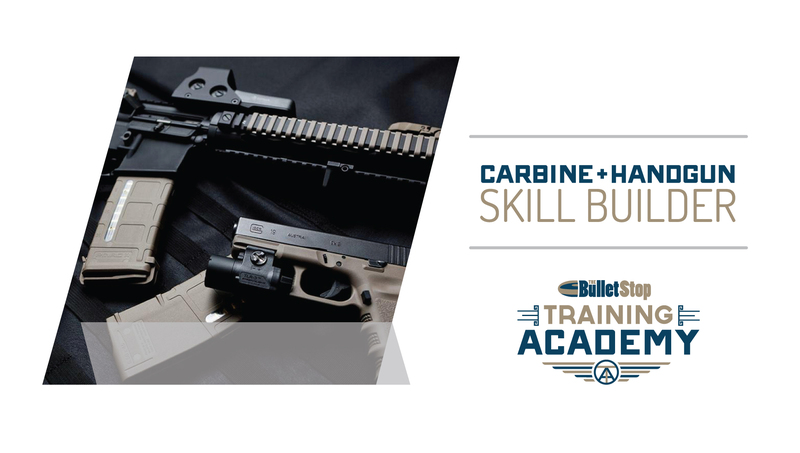 Carbine/Handgun Skills Builder will be taught at Grouse Creek Academy located just 17186 Grouse Creek Road, Ark City, Kansas. It is just off of Highway 166, east of Ark City.